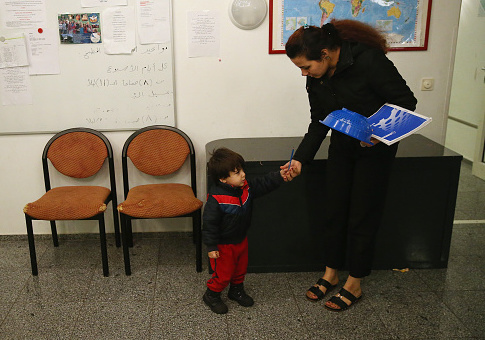 A displaced group of Iranian Christians and other religious minorities persecuted in their homeland are pleading with the Austrian government and Catholic authorities in Vienna not to send them back to Iran after the United States rejected their applications for asylum earlier this week. Members of the group, which has been in legal limbo in Vienna for more than a year while the United States evaluated their cases, fear they will be deported to Iran to be imprisoned, tortured, and possibly killed, according to human-rights activists familiar with the details of the cases. The Austrian police visited at least two of the families at their residences earlier this week, informing them that their visas will soon expire and they will be sent back to Iran unless they take legal steps, such as applying for asylum in Europe, according to Nina Shea, an international human-rights lawyer who directs the Center for Religious Freedom at the Hudson Institute. Many European countries have strict refugee programs and there is no equivalent to the United States' Lautenberg amendment, which previously granted refugee status at a near 100-percent acceptance rate to persecuted religious minorities in Iran and the former Soviet Union. The International Catholic Legislators Network, a nonpartisan group of Catholic lawmakers who work together on issues impacting Catholics and other Christians worldwide, are assisting the group of Iranians and helped set up a meeting with Vienna's Catholic Archbishop Christoph Schonborn this week to see if he can intervene with Austria’s minister of interior. "There's hope that he could weigh in on this, but that doesn't help with the U.S. side of things, of course," Shea said. "The families are now scared to death that they could be sent back to Iran." The Trump administration's decision to deny a large percentage of the group's applications for refugee status is particularly troubling, human rights activists say, because the U.S. government invited them to apply for asylum under the Lautenberg program. A spokesman for the U.S. Commission on International Religious Freedom, a bipartisan federal government agency that monitors religious freedom issues around the globe, expressed concern that the U.S. government rejected the applications. "We are aware of the reports that DHS has issued denials to the approximately 100 Iranian individuals seeking asylum in the U.S. under the Lautenberg Amendment process and are very concerned about this development," the spokesman told the Washington Free Beacon. "We're following the situation closely and hope to comment once we have additional details." Without an explanation for the decision, advocates worry that the Trump administration may be trying to shut down the congressionally authorized Lautenberg Program as part of its more restrictive immigration policies even though President Donald Trump and Vice President Mike Pence have repeatedly vowed to help persecuted religious minorities in the Middle East. They also argue that the asylum denials are inconsistent with the Trump administration's keen interest in elevating the problem of human rights abuses and atrocities in Iran. Just last month, Trump and other top administration officials issued multiple statements in support of Iran's dissidents amid the largest public uprising against the Iranian government since the Green Revolution in 2009. Because the group's asylum status was first put on hold at the end of the Obama administration, Shea also questions whether the group became "political pawns" in an effort to appease Iran during the first months of the implementation of the nuclear deal. "We need to know why they are being rejected and they need to know," she said. "The first decision to block them was done during the Obama administration. It is incumbent on our government, because of our legal and moral obligations after we invited them into our country and to leave Iran, that we review the cases and have transparency about their disposition." Members of the group of Iranians, which is largely Christian but also includes Zoroastrians, Mandeans, and at least one Jewish family, sold their possessions in Iran and cut ties to their homeland to travel to Vienna. Many of them have spent the remainder of their life savings for travel and lodging in Vienna while they waited for the United States to process their applications. The State Department has said it cannot comment on the number of the denials or the exact reasons for them. A spokeswoman stressed that the denials are the result of "changes to the refugee vetting process" introduced during the last year of the Obama administration, not to President Donald Trump's travel ban on people from several Muslim-majority countries coming to the United States or any other Trump executive order. She also said the individuals were subject to the "same rigorous process for resettlement as all refugees" and said the United States, the Austrian government, and others working to together on "protection options" for the group of denied applicants that could include resettlement or asylum "elsewhere." "The United States will not force anyone to return to Iran," the spokeswoman said. The public statements provide little solace for the group or the human-rights activists trying to help them. Shea said there has been "some talk" of trying to resettle some members of the group in Armenia, where the government has a policy of allowing anyone of Armenian descent to return. However, only a percentage of the group has Armenian ancestry and there are much fewer economic opportunities for them there, Shea said. This entry was posted in Issues and tagged Iran. Bookmark the permalink.